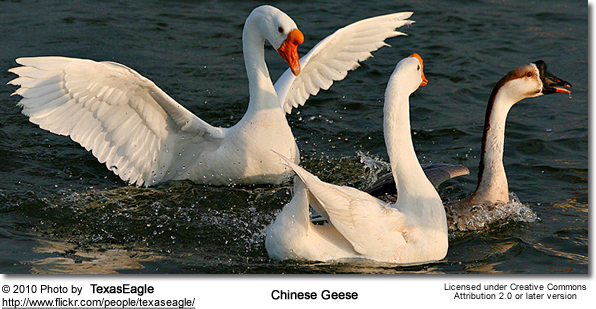 The Swan Geese (Anser cygnoides) -- also known as Chinese Geese - are rare, migratory geese that breed in inland Mongolia, northernmost China, and southeastern Russia; and most migrate to central and eastern China for the winter. Vagrants travel to Japan and Korea for the winter and, on rare occasions, may winter in Kazakhstan, Laos, coastal Siberia, Taiwan, Thailand and Uzbekistan. Outside the breeding season, they form small flocks. They rarely swim and often forage far from the water. 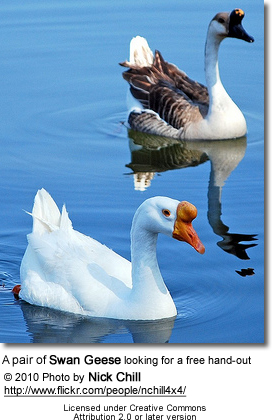 The large Swan Geese have also been introduced to countries outside their natural range, where feral populations of escaped or released domesticated birds have established themselves. Chinese: [da yan], [hong-yan], [yuan e]s ... Czech: Husa labuti, Husa labutí ... Danish: Svanegås ... Dutch: Zwaan gans, Zwaangans ... German: China-Höckergans, Schwanengan ... Finnish: Joutsenhanhi ...French: Oie cygnoïde ... Frisian: Swangoes ... Italian: Cignoide cinese, Oca cigno, Oca cignoide ... Japanese: sakatsuragan, Sakatsura-gan ... Latin: Anser cygnoid, Cygnopsis cygnoides ... Limburgish: Zwanegajs ... Lithuanian: Laibasnap? ža?sis ... Mongolian: ????? ????? ... Norwegian: Svanegås ... Polish: ges labedzionosa, g?? ?ab?dzionosa ... Russian: ??????? ... Slovak: hus labutia ... Spanish: Ansar Cisnal, Ánsar cisnal, Ánsar Cisne ... Swedish: Svangås ... Turkish: Çin kaz? ... Tuvinian: ????-??? 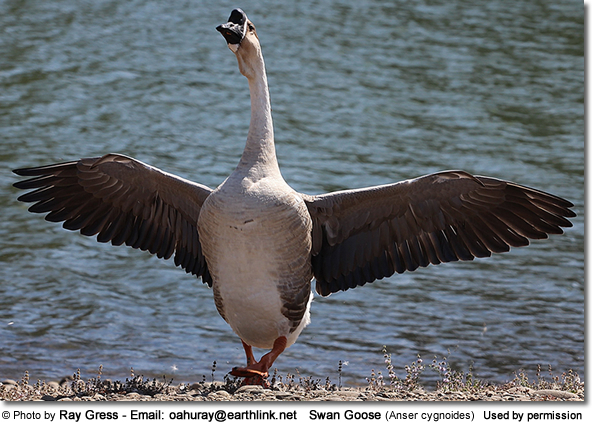 Swan Geese are large, measuring about 81–94 cm in length. 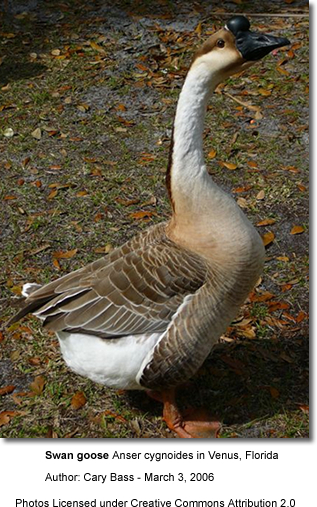 They are the longest of all Anser geese). 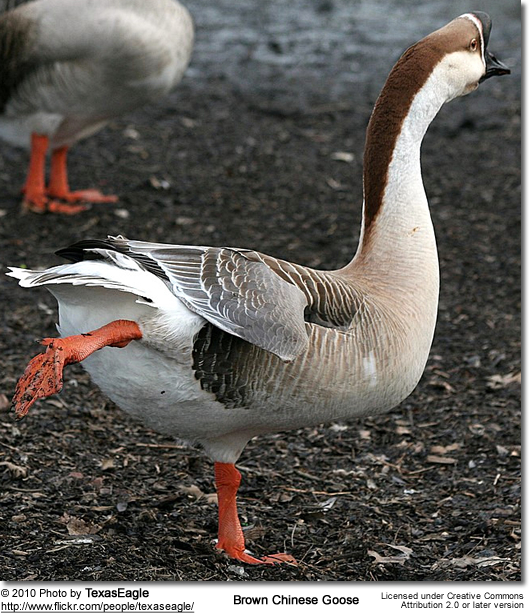 They typically weigh between 2.8–3.5 kg - making this species the second-heaviest Anser goose, second only to the Greylag Goose. The male's wings measures between 45 - 46 cm and the female's 37.5 - 44 cm. The male's bill is about 87 - 98 mm long and the female's about 75 - 85 mm. In the wild form, the heavy bill is completely black; and the legs and feet are orange; and the eyes (irises) are maroon-colored. 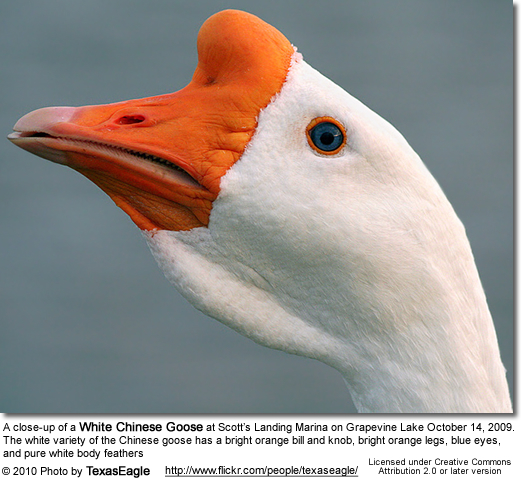 The domestic swan goose sometimes has a white patch behind the bill and typically has a large knob at the base of the bill, which lacks in the wild form. 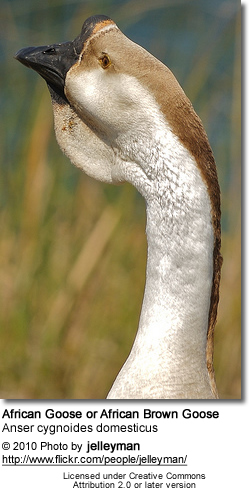 Males and females look alike, except for longer bill and neck and the male's larger size. The plumage varies from the wild type coloring, which is mostly grey with a dark line down the back of the otherwise white neck, to the purely white form. Wild Plumage: The back is greyish-brown with thin light fringes to the larger feathers; the hindneck and cap (reaching just below the eyes) are maroon-colored. The under wing and flight feathers (remiges) are blackish. The plumage below is pale buff, except for the darker streaks on the abdomen and flanks. In flight, the wings look dark. Immature birds have a duller plumage than adults and lack the white bill base and dark streaks on the underside. In April, the Swan Geese return from their wintering ranges, for the breeding season with nesting activities usually occurring in May. 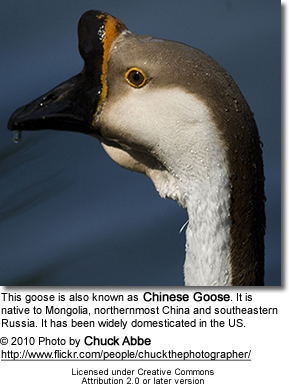 Their nesting habitats are the taiga and mountain valleys near freshwater. Single pairs or loose groups are found near marshes and other wetlands. The average clutch consists of 5 - 6 eggs, but sometimes as many as 8 are laid. The shallow nest, made from plants, is placed directly on the ground. The eggs are incubated for about 28 days to hatching. 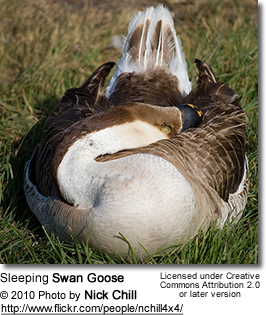 Swan Geese leave their nesting territories around late August or early September for their wintering ranges. The young reach reproductive maturity when they are about 2 - 3 years old. 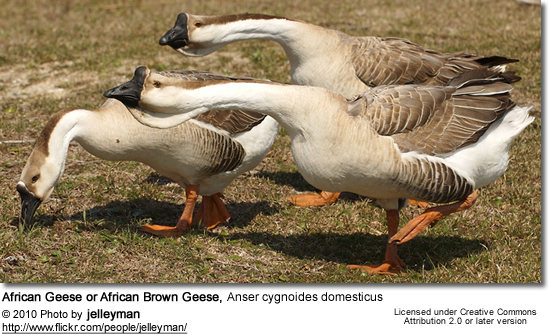 Swan Geese are often seen grazing on plains and stubble fields on plants, such as sedges (Cyperaceae). Ducks and geese generally feed on larvae and pupae usually found under rocks, aquatic animals, plant material, seeds, small fish, snails and crabs.